Help to promote your business with our House shaped Key fob with logo from Calendar Lady Promotions. Simply have your business details and company logo printed upon our House shaped Key fob with logo and give them away to friends and customers. They will travel far with your own personal advertisement. Many different shapes also available. 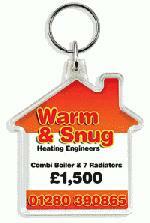 So advertise your company details upon our House shaped Key fob with logo today! Other promotional and personalised items besides our House shaped Key fob with logo click here. To find out more about our House shaped Key fob with logo click here and fill in the contact form and we'll get straight back to you.